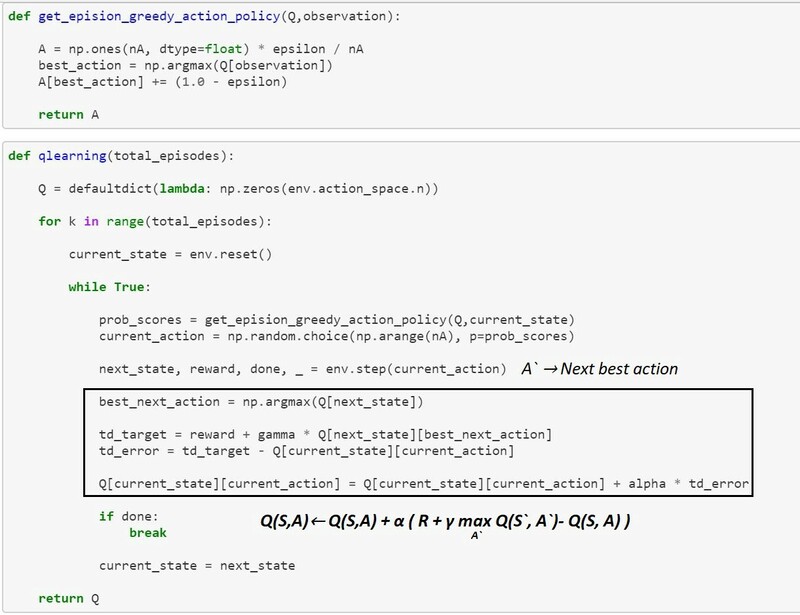 Welcome back to Reinforcement learning part 2. In the last story we talked about RL with dynamic programming, in this story we talk about other methods. Please go through the first part as many components are connected. Recap a bit from part 1. 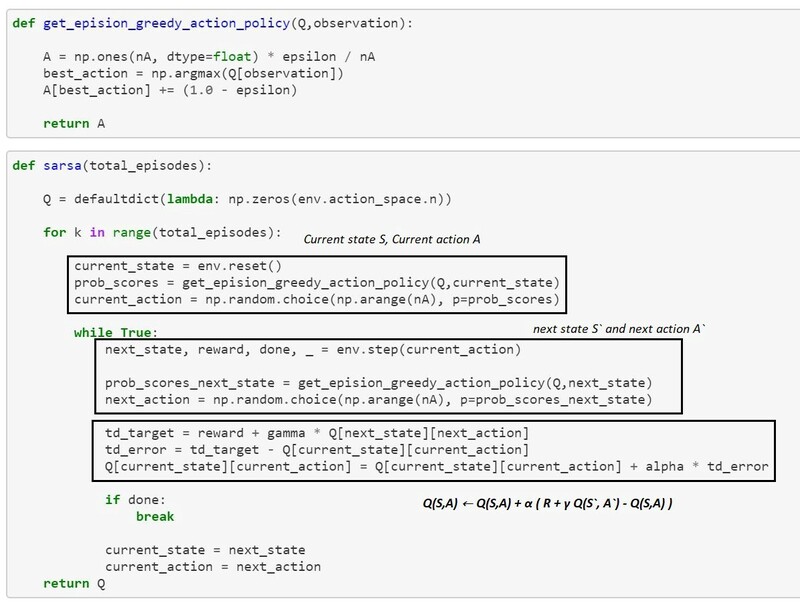 → Reinforcement learning is all about learning from the environment through interactions. → Finding the optimal policy / optimal value functions is the key for solving reinforcement learning problems. →Dynamic programming methods are used to find optimal policy/optimal value functions using the bellman optimality equations. →Dynamic programming methods are model based methods, require the complete knowledge of environment. such as transition probabilities and rewards. Before we dive into the Model free methods , let me define couple of concepts so the rest is gonna be pretty easy to understand. Prediction : This type of task predicts the expected total reward from any given state assuming the function π(a|s) is given. ( in other words) Policy π is given, it calculates the Value function Vπ with or without the model. 2. Control : This type of task finds the policy π(a|s) that maximizes the expected total reward from any given state. (in other words) Some Policy π is given , it finds the Optimal policy π*. 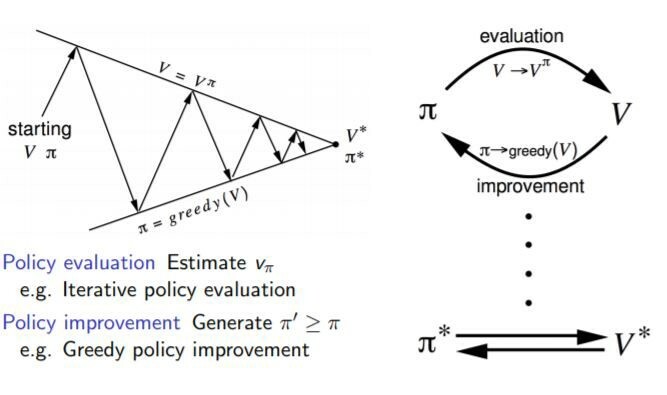 Policy iteration is the combination of both to find the optimal policy. Just like in supervised learning , we have regression and classification tasks, in reinforcement learning, we have prediction and control tasks. On policy learning : It learns on the job. which means it evaluates or improves the policy that is used to make the decisions. (In other words) it directly learns a policy which gives you decisions about which action to take in some state. 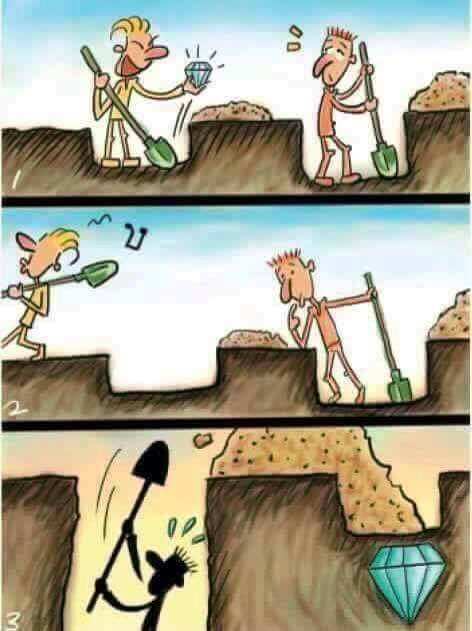 just like we learn to do something while observing others doing the same thing. target policy may be deterministic ( ex: greedy ) while behavior policy is stochastic. In RL problems we have two different tasks in nature. we only get the reward at the end of the task or another option is to distribute the reward evenly across all actions taken in that episode. Ex: you lost the queen (-10 points), you lost one of the rooks (-5 points) etc..
Ex: Trading in the cryptocurrency markets or learning Machine learning on internet. In MDP , we are given all the components to solve a problem, but what if we are not given some of the components ??? 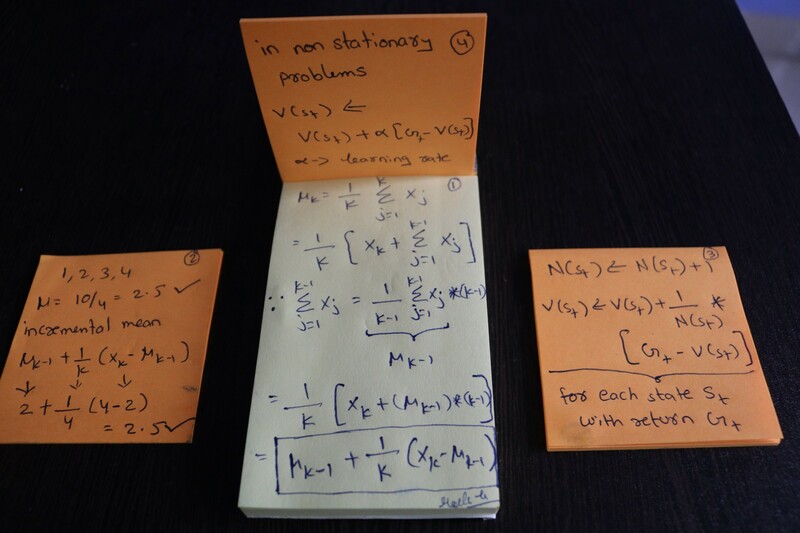 what if we are not given the transition probabilities and rewards for a RL problem?? That means we are not given the dynamics of the environment. 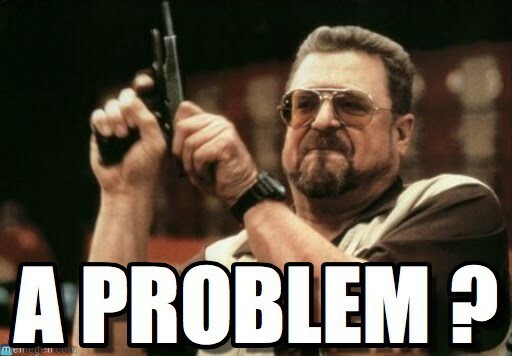 can we solve the problem?? , if so How??? 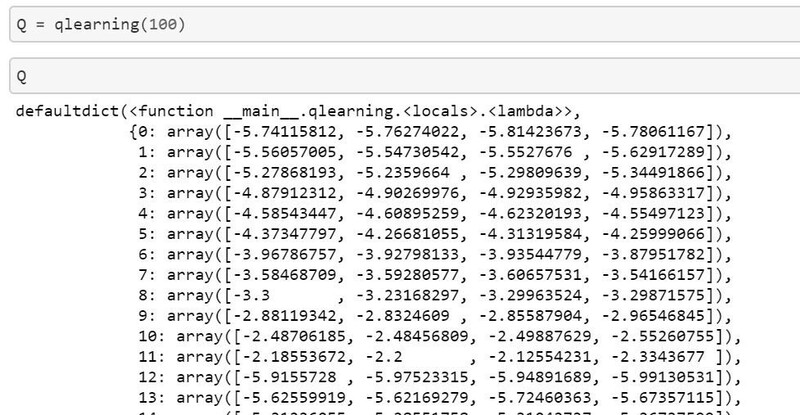 All model free learning algorithms are gonna the learn value functions directly from the environment. How to figure out V for unknown MDP ( assume we get the policy)?? 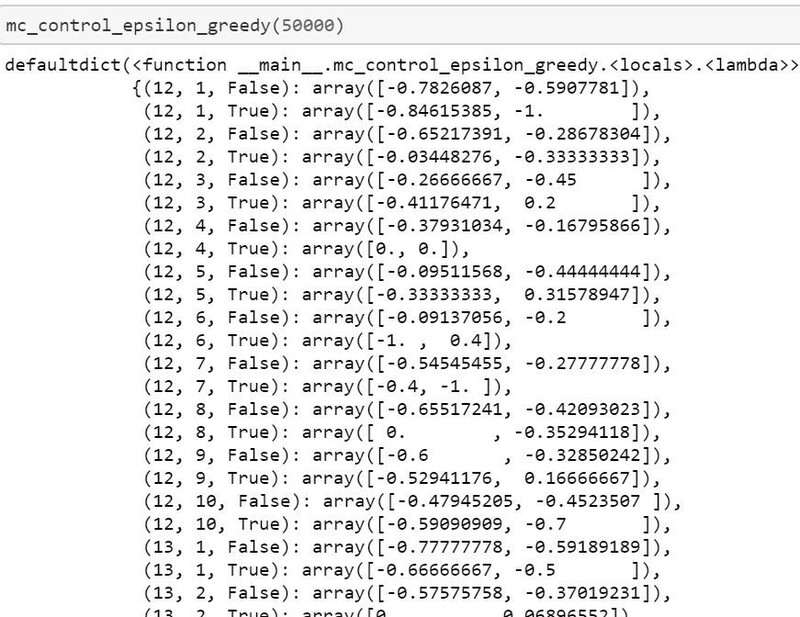 Monte Carlo learning → it learns value functions directly from episodes of experience. we know the value function from the last story. what is a sample return?? 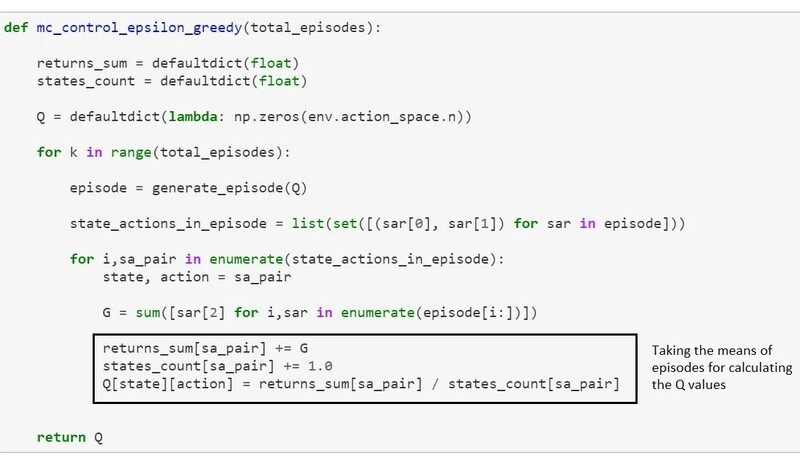 so sample return could mean average of returns(rewards) from episodes. Monte Carlo takes means of episodes. Period! Usually the focus should be on first visit MC. we know how to calculate the mean if we have all the values but what if we don’t have all the values ( we get values as episodes pass) ??? how to calculate the mean ??? μk = the mean of K items. In above picture, 1 talks about incremental mean, 2 is a sample proof, 3 is the monte carlo value function update and 4 is the same but for non stationary problems. In non-stationary problems, it can be useful to track a running mean, i.e. forget old episodes. 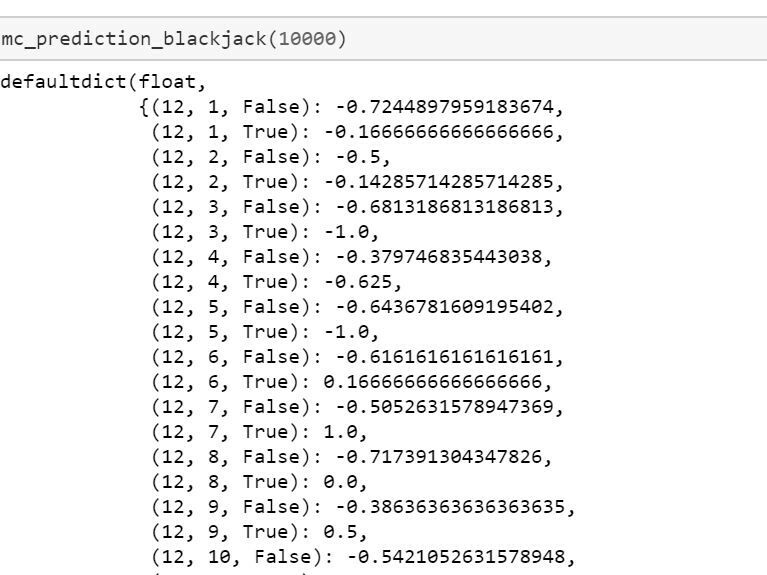 Note: The problem I took to write the code is “Blackjack card game”, I hope/assume you know the game otherwise just get to know on google it’s an easy game to understand. 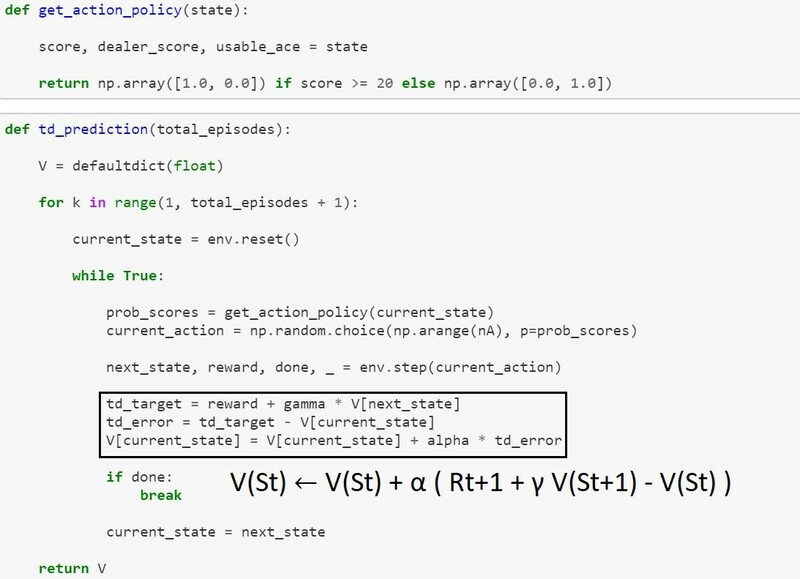 As the algorithm above says, first we focus on generating episodes using the policy then we take the average of episodes. We repeat this forever or a fixed no of times. This has few states values only. Okay so far we talked about the Monte Carlo method for prediction, let’s just talk about the Monte Carlo method for Control tasks. it has policy evaluation and policy improvement. 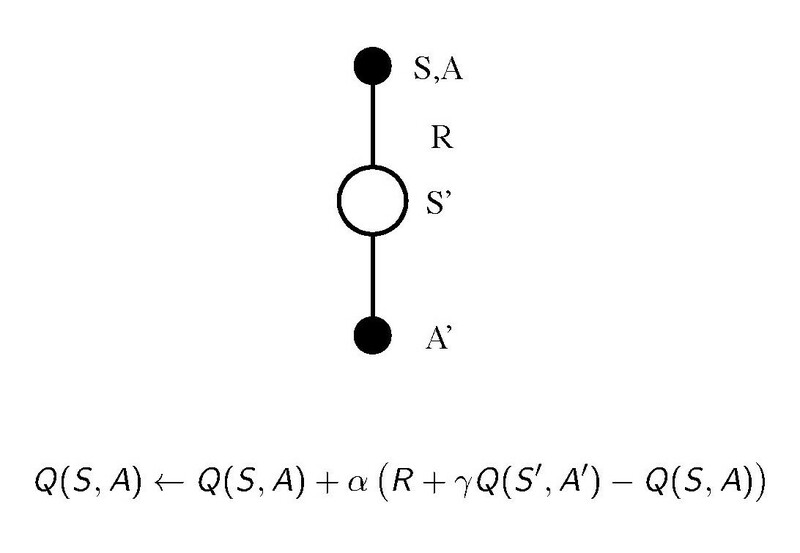 Q(S,A) ← Expected return when starting state S, taking the action A, thereafter following policy π.
First-visit-MC for Q(S,A) →A state action pair is said to be visited in an episode if S is visited and A is taken in that episode. but there is a problem..
if we do the same thing here, then we may get the exploration problem. This is really an important concept not just in RL but in our real life too. in model free RL, we need to interact with the environment to find out the best strategy so we need to explore the entire the state space while figuring out best actions. Exploration : is about finding more information about the environment. (in other words) exploring a lot of states and actions in the environment. Exploitation : is about exploiting the known information to maximize the reward. it is like you go to a restaurant , ordering the item/dish you like is exploitation and ordering something you have never/limited tried is exploration. if we act greedily we end up choosing one action forever #that’s a problem. Yeah! due to exploration problem we don’t act greedily in MC to improve the policy , instead , we use the epsilon-greedy policy. This is a comparison between from the last story policy iteration in DP and policy iteration in MC with epsilon greedy policy. the best known action based on our experience is selected with (1-epsilon) probability and the rest of time i.e. 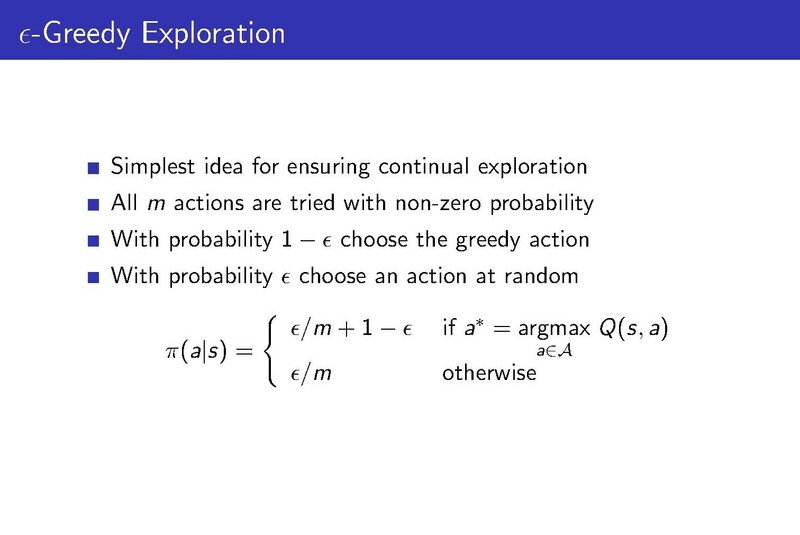 with epsilon probability any action is selected randomly. will see more about this in coming stories, so here is a good slide from david silver’s course. 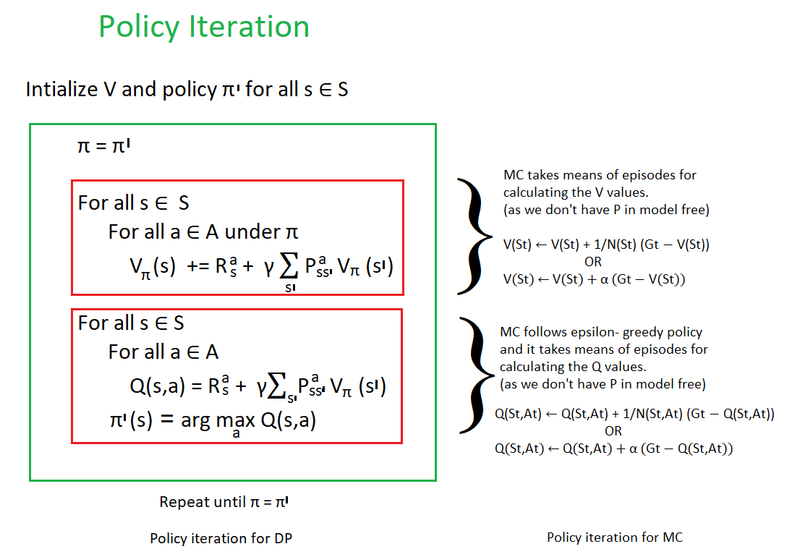 in this algorithm we are not only calculating the Q value but also improving the policy using the updated Q value. 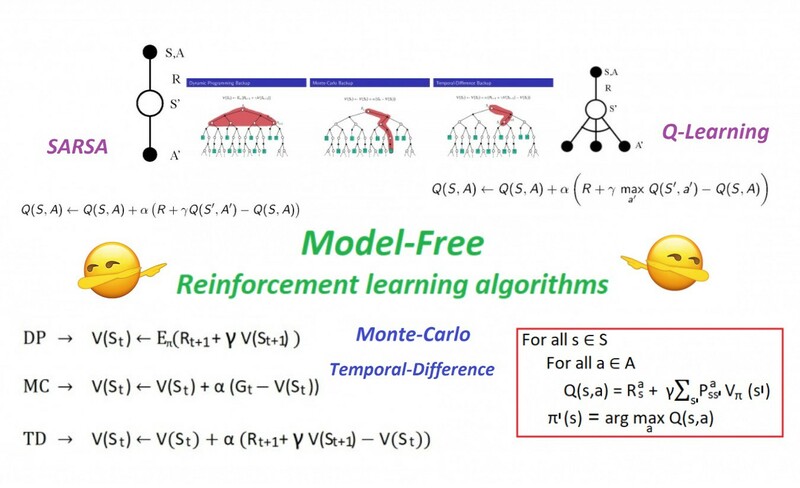 Just like Monte Carlo → TD methods learn directly from episodes of experience and model free. Just like Dynamic Programming → TD methods boot strap , meaning it will not wait until the end of the episode to update the expected future reward estimation(V) , it will only wait until the next time step to update the value estimates. 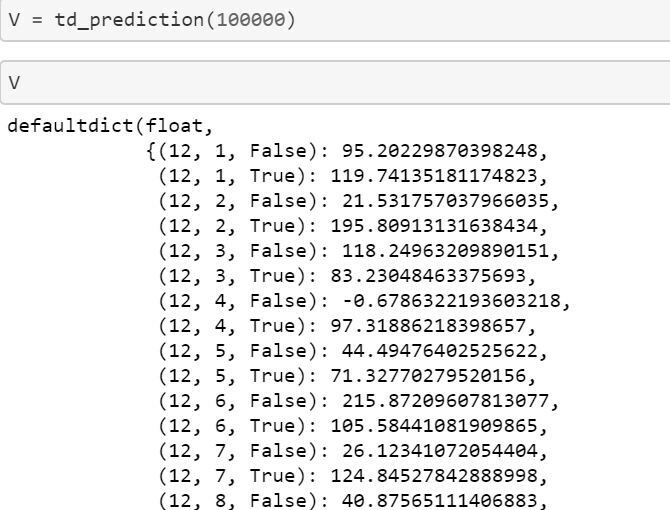 These use the bellman equation to update the estimates. in TD, at every time step t they immediately form a TD target using the observed reward Rt+1 and the current estimate V(St+1). taken from david’s and merged together. Okay I hope you get some idea about TD. Let’s just talk TD-Prediction and Control. The first step is to learn an action-value function rather than a state-value function. 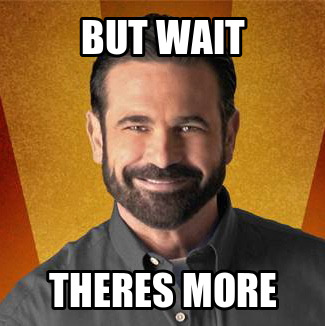 →Then updates the value of A1 performed in S1. That gives the above equation. 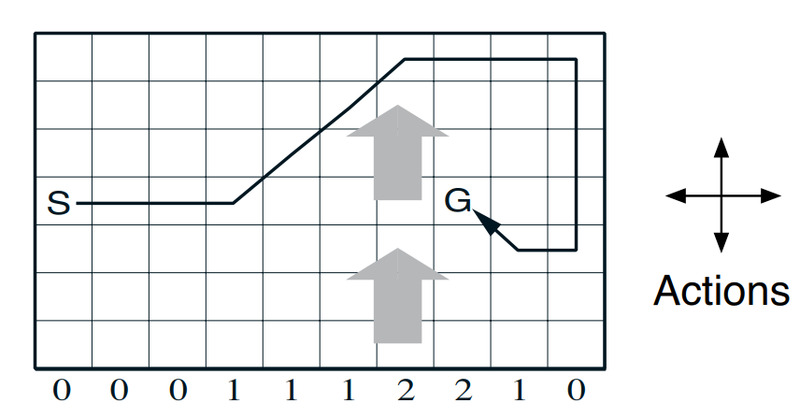 The figure below is a standard grid-world, with start and goal states, but with one diﬀerence: there is a crosswind upward through the middle of the grid. The actions are the standard four — up, down,right, and left — but in the middle region the resultant next states are shifted upward by a “wind,” the strength of which varies from column to column. The strength of the wind is given below each column, in number of cells shifted upward. For example, if you are one cell to the right of the goal, then the action left takes you to the cell just above the goal. Let us treat this as an undiscounted episodic task, with constant rewards of −1 until the goal state is reached. I took another environment “ Cliff Walking” you can learn more about it online or in sutton’s book . → it will only wait until the next time step to update the value estimates. → We use model free algorithms when Transition probability P (dynamics of the system)is not given in MDP. 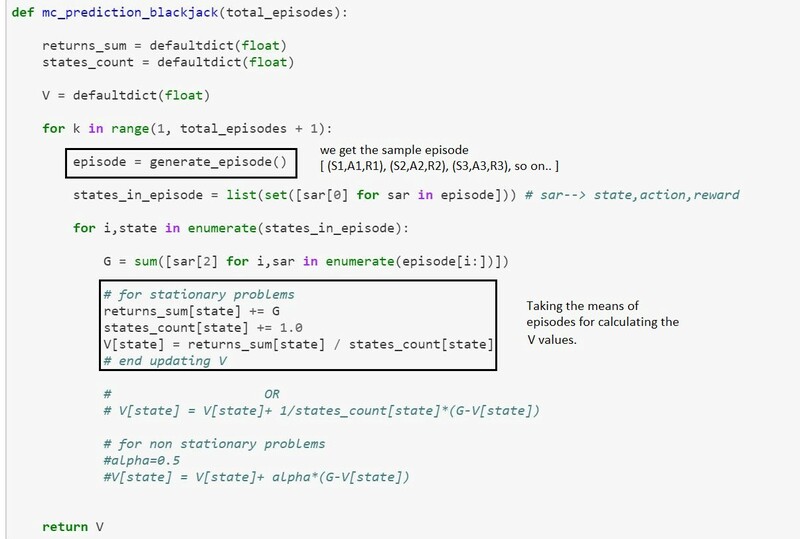 → Monte Carlo takes the means of episodes to calculate the V and Q values for both prediction and control tasks. → TD combines the features of both DP and MC by learning through interacting with the environment with bootstrapping. 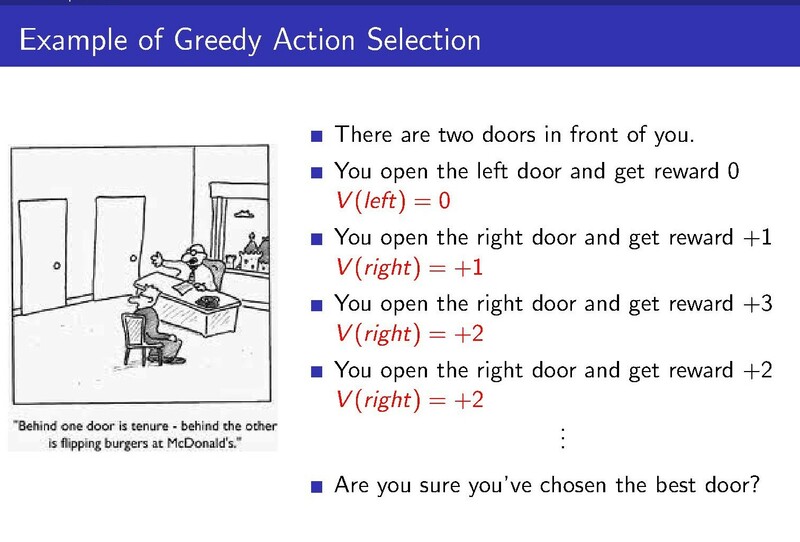 → We use epsilon greedy policy to avoid the exploration problem in the env. → Sarsa updates the Q value by choosing the current action and next action using the same policy, making it an on policy method. → Q-learning updates Q values by acting greedily on the environment while following another policy, making it an off policy method. so That’s all in this story, there are still couple of things/concepts left , I will talk about them in coming stories. have a great day or night!